They maybe spared Lupus because of his previous record? Perhaps Fortuna is beginning to smile on the ludus of Ahenobarbus? A good win in a prime location will boost his reputation, and the money will help too. GALLUS wins a further 5 aureus for the win taking his balance to 20. He is also in line to pick up a fourth skill (which do you want?). A few days after the games, the slave Helios comes to see Ahenobarbus, as usual on the pretext of collecting rent for Athenodorus, but in fact to convey the patron's requests (= instructions). Athenodorus is in a tricky position. As a romanised Greek he is secretly despised (but feared) by his Greek compatriots in Antioch society. The Romans while appreciating his usefulness also do not fully trust him. He also faces a medium term dilemma: suspecting that Mucianus and Vespasian are plotting to seize the throne, should he throw in his lot with them or blow the whistle? As civil war continues in the West, the potential rewards of getting it right, and risks of getting it wrong, are enormous. As City Aedile, Athenodorus is responsible for such important but boring jobs as road maintenance, markets supervision, and water supply. The actual work of course is done by public slaves including supervisors and professionals, and by contractors. He does not have any armed force. Right now this is causing him a problem that needs to be solved discreetly. 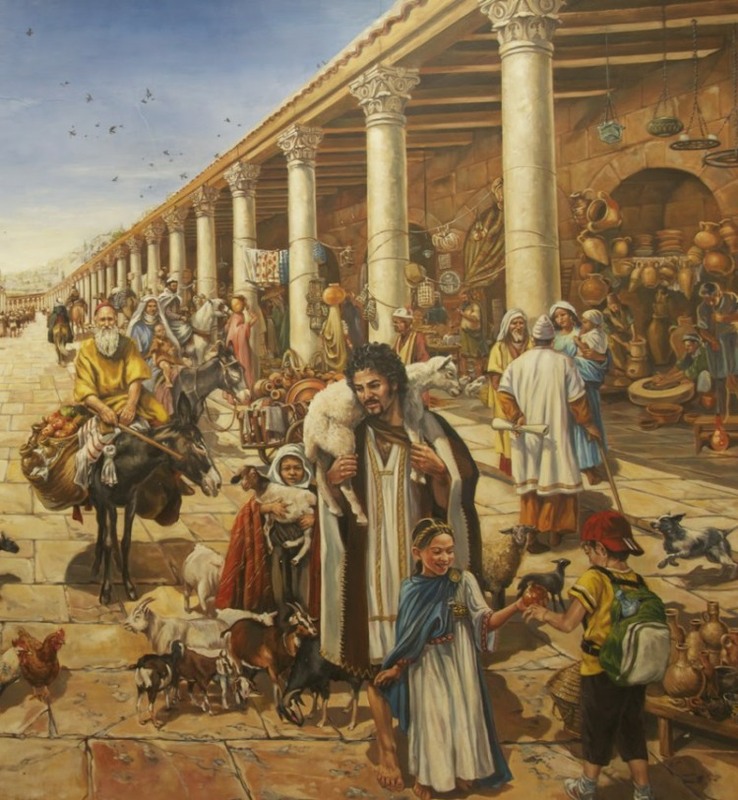 As Helios briefs Ahenobarbus, the Blue Gate market (one of the City's smaller markets, near the Damascus Gate) is being encroached on by a local standover gang, led by Pericles. They are trying to seize control and collect the usual bribes, previously going into Athenodorus's pocket, for themselves. Or, as is suspected, for another shadowy player, even Miltiades the City Prefect, another romanised Greek, and actually a Roman citizen, to whom Athenodorus nominally reports as Aedile. Obviously he must tread carefully, but he must act. 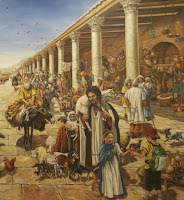 Ahenobarbus's instructions are to form a squad and ambush Pericles's gang at the market, and "get rid of them for good". The gang usually comprises 4-6 men, none of them veterans or gladiators, only street toughs, although Pericles himself is a notorious "hard man" suspected to have committed several murders. Ahenobarbus should take enough men to do a thorough job. 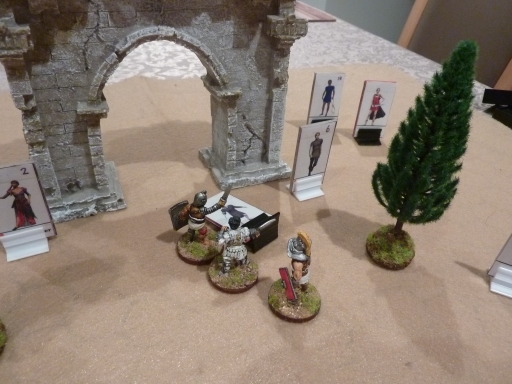 Getting the Pericles gang to run away is not enough as they will come back with reinforcements. And none of the many civilians who will be in the market are to be harmed. The City Watch will not show up (they will be incentivised to patrol somewhere else). Please run this as an asymmetric SBH game. The basic street fighters on each side would be Q4 C2 but veterans and gladiators that Ahenobarbus "might have available" could be Q3 C3-4? Details up to you. If Ahenobarbus goes himself, maybe a hero or combat master? The aim is to kill or capture as many as possible, including Pericles and at least 50% of his gang members. Capture would be good as they can be tortured for information. The above picture shows the 6 gang members with black bases (circled in red) entering through an arch commemorating of triumph of some random Roman general. 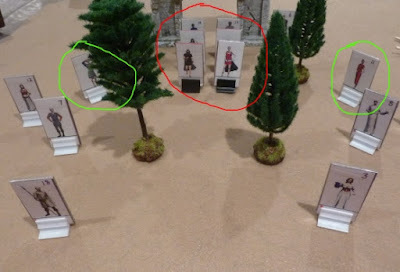 A bunch of civilians with white bases were milling about, the two that are highlighted in green are prostitutes who have a “distract” ability, adding 1 to a figures Q dice when within a short move (one male, one female). The gang moved first but rolled a triple failure. It was clear that Pericles was not amongst the group, and they had no strong leadership. The 3 gladiators on the other hand, moved freely and attacked. Though an even point fight, it was a very quick, one sided engagement. Overall, a sort of failure. The gang members were not that brave (apart from one) without Pericles. 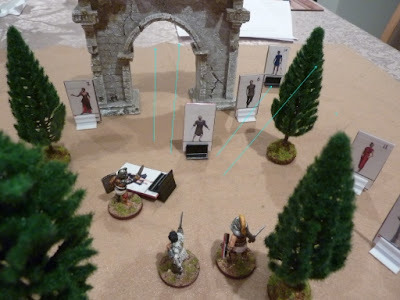 One henchman dead, one captured, and 4 escaped…..